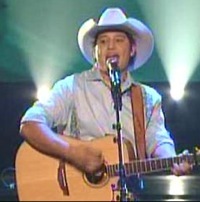 Gabe Garcia made it past the elimination round of tonight's Nashville Star on NBC. This puts Gabe into the top eight contestants; he needs to make it to the top six to pass Melanie Torres' seventh-place finish in Season Four. Beating John Arthur Martinez's second-place Season Two finish would give Garcia the top spot this year. Gabe is naturally glad to see his family and comes on to perform “Wanted Dead or Alive” and “The Fireman.” The judges thought he was great, finally bringing in some performing ability to go along with his great country singing.